The line cooks are hunched over their masterpieces. Constructing, arranging, refining. A waiter floats by, balancing a perfect three-plate carry. The air is thick with exquisite concentration. I am in one of the world's most famous and prestigious commercial kitchens. The kitchen of Noma, Copenhagen. Okay, I wish. I'm actually gazing upon a magnificent 150 x 180 cm oil-on-linen painting of Noma's kitchen, created by Jeff Martin for his latest Back of House exhibition. Noma, 2011; Jeff Martin, Back of House - The World. Picture used with permission of Gould Galleries. Jeff Martin's Back of House series began in 2007 with his portrayals of Melbourne's well-heralded local institutions - amongst those, Abla's, Flower Drum, and Jacques Reymond, to mention a few. This was followed by a Sydney sequel, with Aria, Tetsuya's and Guillaume at Bennelong headlining another impressive list of big names. And now we have Back of House - The World, which transports us to the kitchens of the calibre of Noma, Le Chateaubriand, and French Laundry. The typical commercial kitchen tends to be sterile in colour - think lots of silvery-grays - but vibrant in atmosphere, individual quirks emphasized by the people who work within. It is invariably busy. There is always something to be done - quickly, carefully, perfectly. It is a place fraught with tension; overflowing with expression. And I can see it all in the Back of House paintings (a favourite is the one of Oud Sluis in Holland - sleek, but flush with character). You may notice - as I did - that the plates and pans are all blank; yet somehow, it feels right. It's not about the food here. It's about the space where the food is made. It's about those who give it their best behind the scenes. And it looks so very grand indeed when you're standing right there, taking it in. Oud Sluis, 2011; Jeff Martin, Back of House - The World. Picture used with permission of Gould Galleries. The images here are a teaser, and do not do justice to the actual paintings in all their glory. For real impact, go for a stroll in the gallery before the entire exhibition is flown off to London for the San Pellegrino The World's 50 Best Restaurants Awards. 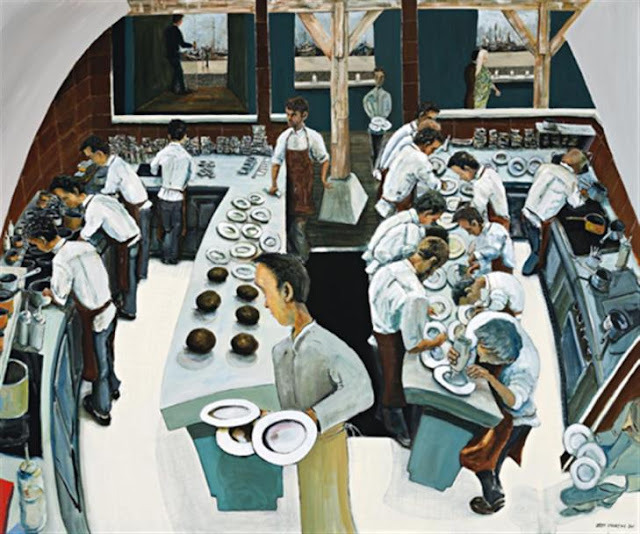 The Melbourne Food & Wine Festival may be over, but Back of House - The World by Jeff Martin is still exhibiting at Gould Galleries until the 10th of April. It's not a huge one (19 works in total), but well worth dropping by if you're an art lover, or if you happen to be in the neighbourhood. What: Jeff Martin, Back of House - The World. Where: Gould Galleries, 270 Toorak Road, South Yarra, 3141 Victoria, Australia. When: 1st March 2012 - 10th April 2012 (extended from original end date March 31st). Pricing: Free Entry. Price of works range from $1,600 to $13,500. 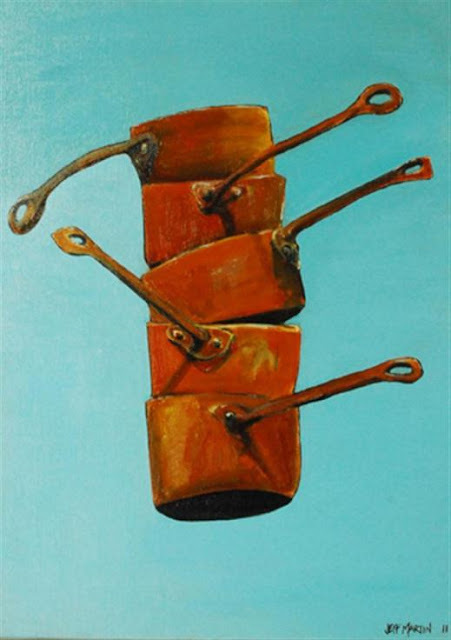 Five Copper Pots, 2011; Jeff Martin, Back of House - The World. Picture used with permission of Gould Galleries. I absolutely love the idea behind this series. Thanks for drawing my attention to his work, I hadn't seen it before. It's pretty great hey? 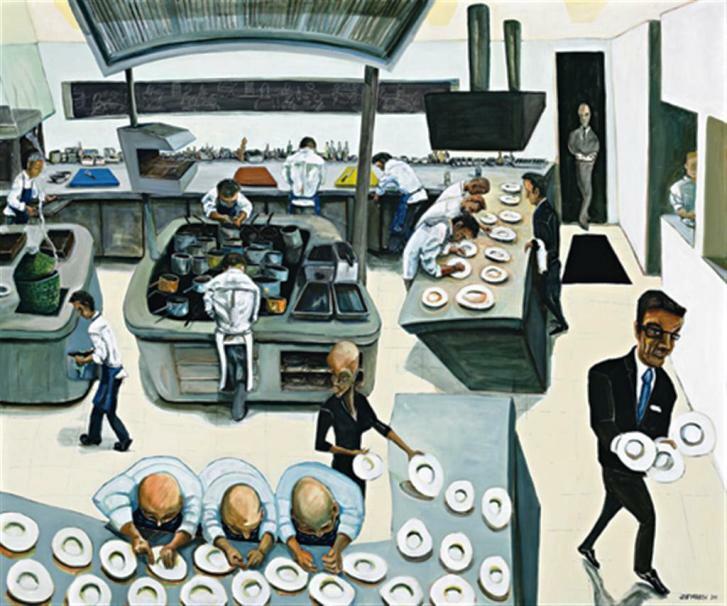 I checked out the other paintings in the series on his website and really liked the inaugural one, based on Melbourne restaurants, too. Oh! :( I can't get to Melbourne by April 10th. I actually love the way the chefs are hunched over empty plates. It makes me giggle. Ha, I was a little thrown when I first noticed it but then I figured it made sense as there was enough going on in the paintings as it was. Love these paintings... you really do get a sense of movement and even franticness. The copper pots are fabulous! Yes, I really liked the painting of the copper pots too! There's just something charming about it. There is so much going on in that kitchen painting. It's one of those paintings you can look at and always see something new. Very true. I walked around the gallery a few times and enjoyed returning to each painting again and again. Haha! Gotcha... I do kid. If only, sigh. An original post and imaginative introduction. A breath of fresh air and a wonderful insight into this artistic-yet-culinary world. I wish i could get to Melbourne for this exhibition. Thanks! I thought it was a pretty cool subject to explore - quite different to the usual food blog posts.